For those that are searching for me lately… please see my latest posts at the following website! 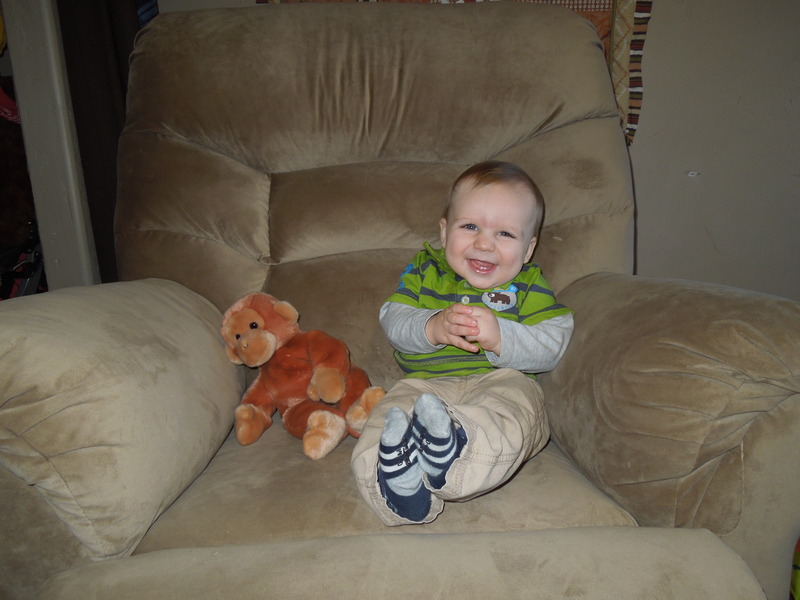 Happy 9 month b-day sweet Kelvin! Between last months post and this one, Kelvin has mastered the crawl (legitimately crawl rather than the scoot he had going on) has started to wave (mainly just at Greg)… say ma-ma and da-dad… along with some ba-ba’s – among other combinations of squeals, yells and other interesting sound effects! I think he has definitely found his voice! He loves to tell us things even if we can’t understand him… and sometimes with such passion that it makes us laugh! He is a very happy and smiley little guy and we just love him to pieces! And he now has 4 teeth with more due any day! 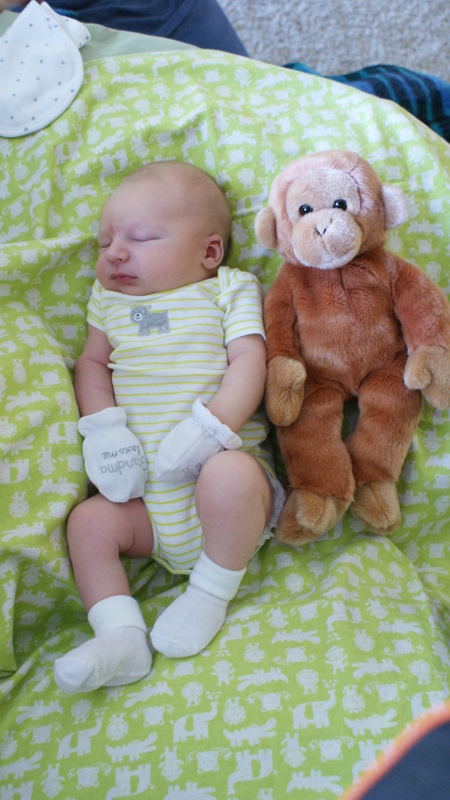 Here are his past monkey pics for those of you just tuning in! we were both laughing so hard during this session that we may have to retake some… but I still love them! Just for fun (because I could not wait until 12 months), here is a side by side comparing month 0 and month 9! This project took me a super long time to complete… (and it is still not done, but by complete in this case I mean… get to where I can start using it) Not that it will take YOU forever if you decide to do something similar… But I’ve had a lot going on mixed with going through periods of forgetfulness that I even had started this project, but anyways – whatever, right? Emabassingly, I started this in March (2012). I am the type of person that likes to keep a planner or some kind of calendar… somewhere to write birthdays, events, lists etc, but since I finished my schooling I never end up carrying it! I have a hard enough time remembering to bring along a diaper bag since I am not a purse person. I grab my keys, phone, little guy and go! 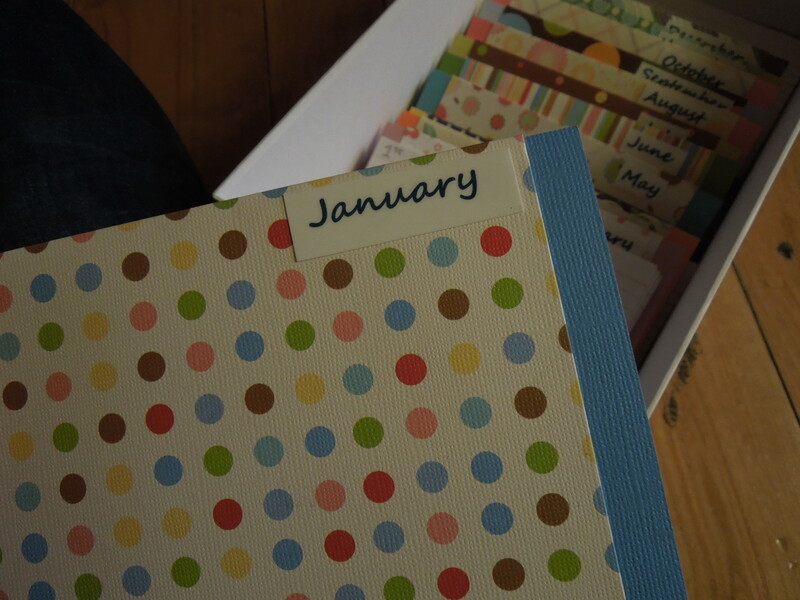 For me, the problem with a planner or calendar is that every year it becomes obsolete and you have to transfer everything over to a brand new one… and they seem to get more and more expensive. What happened for 2012 was: I bought a planner, took the time to transfer everything over in my neatest of writing then NEVER used it! This is the “so-far” of my calendar box! 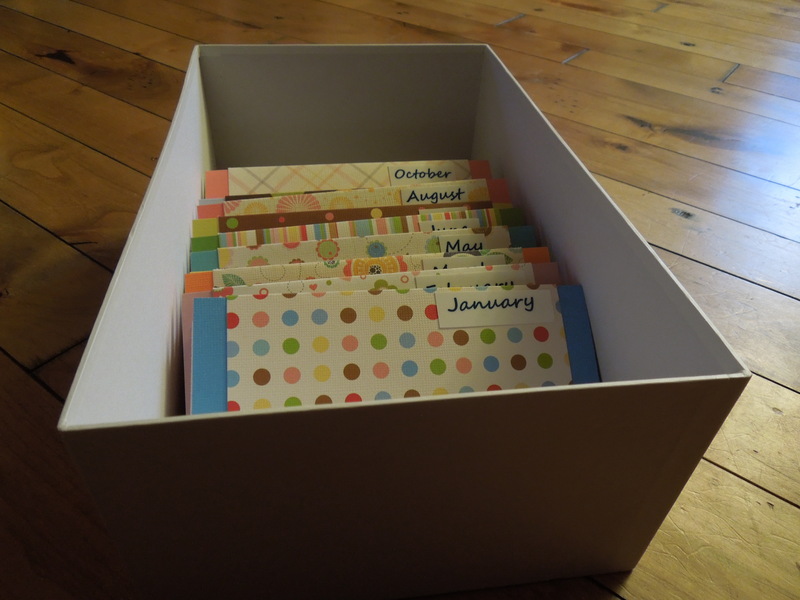 The idea was to look almost like an old-fashioned recipe box with each month being a tab and behind it being cards labeled for each day of the month! 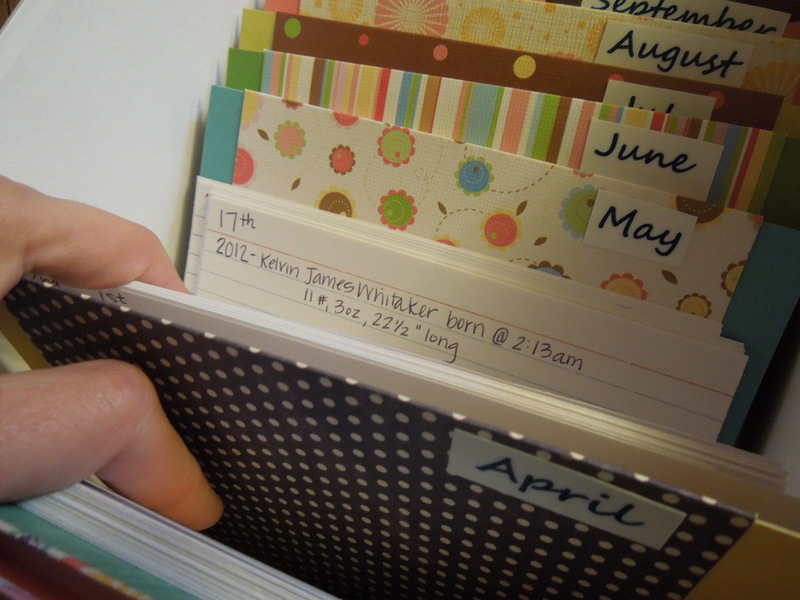 This way once I write someones birthday or anniversary, it is always there! I decided to print my month labels off on the computer… I was just ready to get this thing to a useable state! 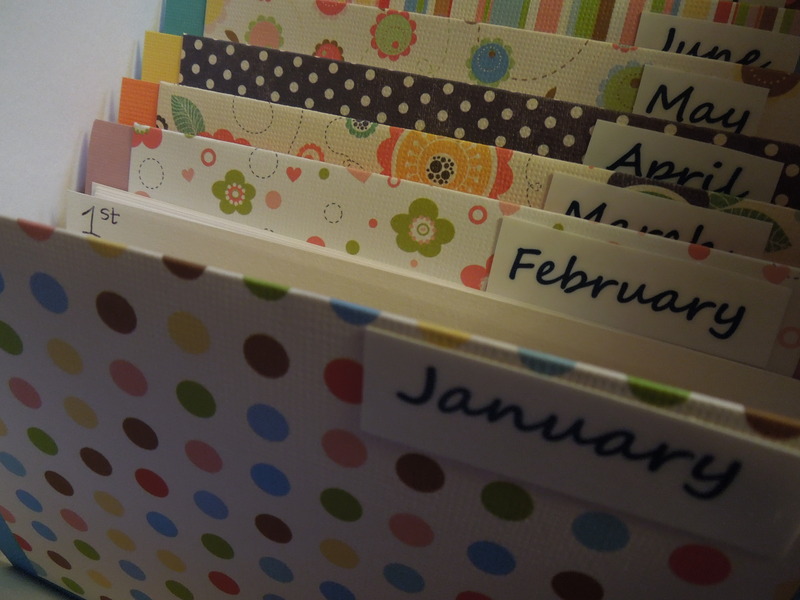 I gave each of the month “tabs” fun paper and glued it onto a piece of cardstock to give it some substance! The design paper you see was actually from a huge box of cards I had (blank inside with just neat designs on the front) acquired from a huge party store in Portland… I just sandwiched each over a plain color of cardstock to give each month different flair! 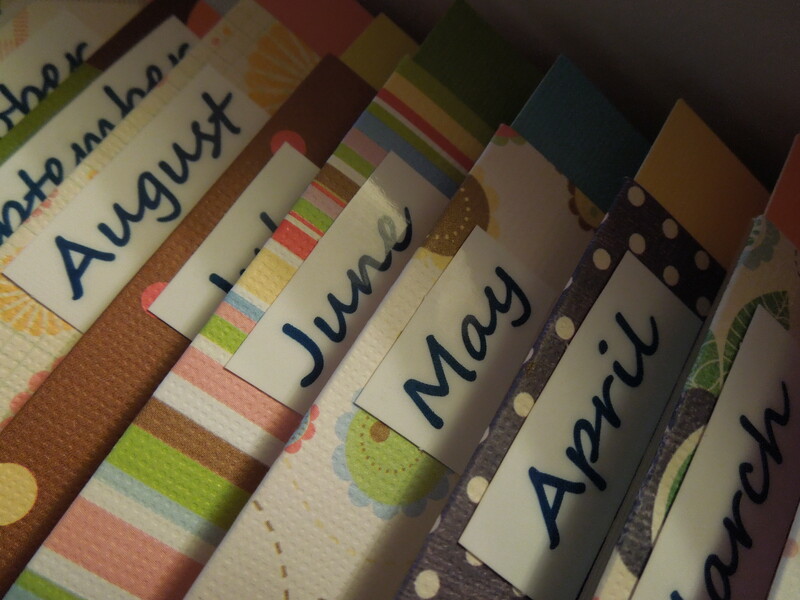 My husband and I had been wanting a way to keep track of events, special occasions and more in one place! So I really hope this will help… we like to reflect back and keep track of all the blessings and things we have enjoyed… what we have been given… having them jotted down to reflect back on helps us stay thankful and positive when things may seem to be less than ideal. This should really be fun a few years down the road when we can be writing something on a specific day and be able to look back at others things that happened in prior years! and he of course wanted to be in on all the action! I have some neat paper that I will wrap my box with to give it some personality (as if boxes have personality, but you get it… right?) I just need to choose which of my fun papers to use… and do it when my little one is pre-occupied or napping because as you can see he will want to help! 🙂 Bless his sweet bones! I’m not sure what else I will do to my box, but for now – I have a calendar box to start using and I love the fact that all the events I transfer over will still be there for years to come! Happy Crafting! And, again… Happy New Year! I love fruit… Especially berries! I tossed some blueberries (around 1 cup), a banana, a scoop of protein powder and some milk and plain Greek yogurt into my immersion blender container and let the thing work it’s magic…. 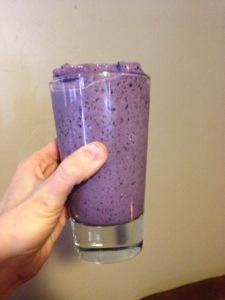 And then a yummy smoothie was brought into the world! This was our sweet sweet boy’s very first Christmas! Of course I was prego when we came “home” to be with my family last year, but obviously not the same. I felt the most excited about Christmas ever it felt like…I am over-joyed and thankful for our precious little one and was so happy for him to experience Christmas for the very first time. 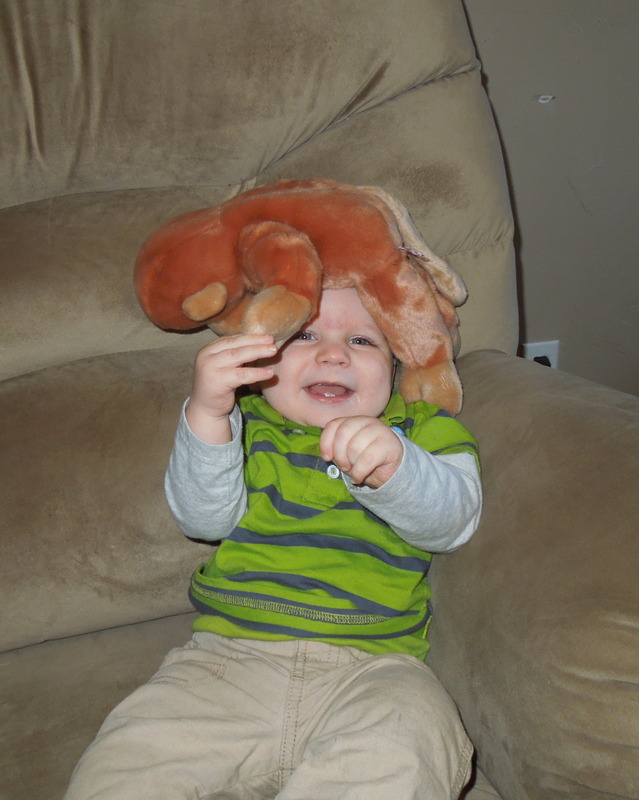 I know, he is only 8 months old and he won’t remember and won’t care… but hey, no matter! We had a blast! did I mention he LOVED the bows? Anyways, we had a super fun Christmas and entire holiday season as a matter of fact! Our super year of 2012 in a nut-shell, or a large lake… whichever is more fitting! 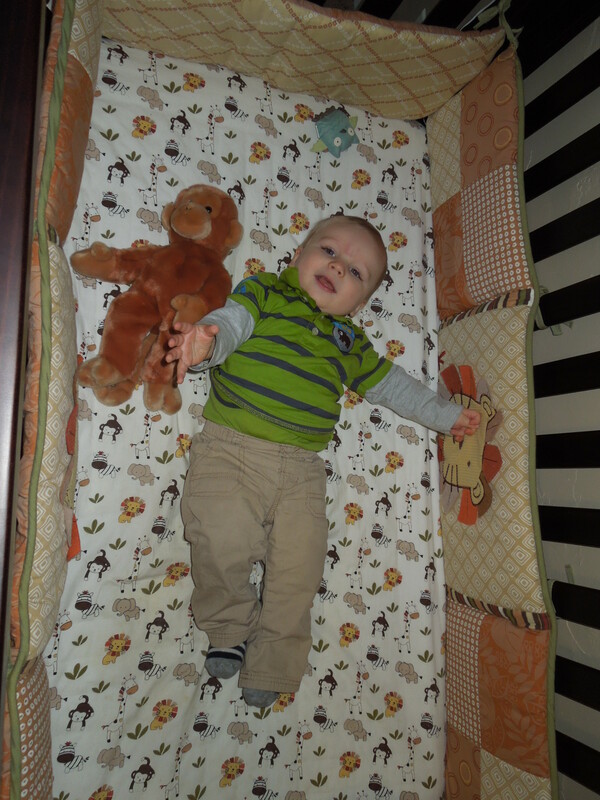 We had a beautiful, healthy, bouncy, perfect baby boy in April… 11 lbs, 3 oz and 22.5″ long! We are so in love with this little being! 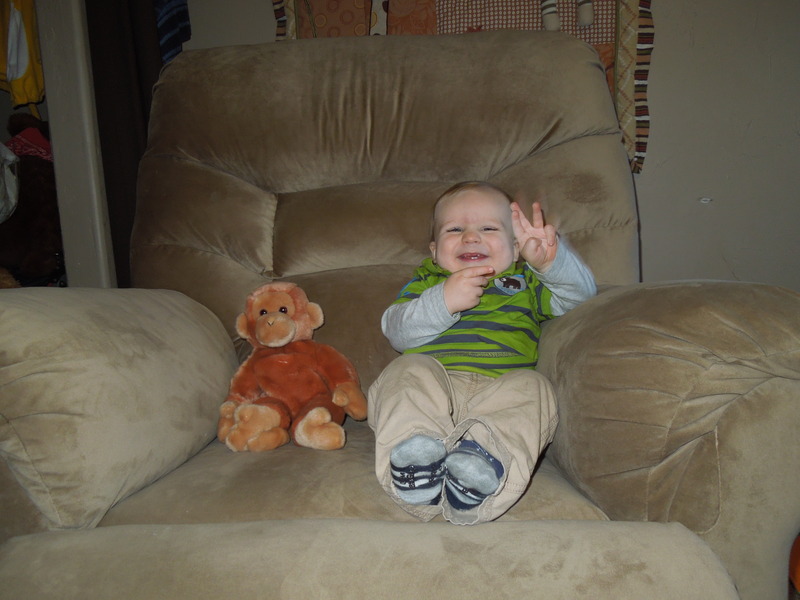 Here he is then during his first week of life… and here he is now – 8 months later! I had my little man in time for my first mother’s day! We moved… all the way across the entire country with a dog (pictured below) and a 7-9 week old depending on where we were on our journey. We got to Bend in time to enjoy the beautiful sunny summer! I tried to keep it short so I left out a lot – oh well! We had a terrific year, full of fun, challenges, less than ideal sleep but overflowing with laughter, joy and thankfulness! I would not change anything about our year! We hope you had a wonderful year and are anticipating an even better 2013! It is my hope… dare I say a resolution to post and share more! Well see you all another post! I cannot believe 2013 is right around the corner… like very soon! I am in a very happy state at the moment, not only because we get to start a brand new year soon, but also because my baby is sound asleep in his crib and I can hear his ever-so-sweet snores… I just pulled some chocolate peanut-butter bars out of the oven and the house smells heavenly… my sweet and thoughtful husband just walked in the door with a big smile on his face because he came to deliver me my favorite Starbucks drink and a huge hug before turning around and going to play x-box with my brother… and my belly is STILL full from eating at my favorite restaurant after church! May your year ahead be the best yet! Thanks for visiting and I am thrilled you are here! Please, feel free to comment and get in on the fun! This blog really has no theme or scheme... it will ever be changing depending on where I am in life and what comes to mind for each post! If there is nothing that excites you now, tune back another time! These brownies are addictive, and they magically bake up with a crinkly chewy crust and rich fudgy insides -- which is exactly what a perfect brownie should be! They are a MUST for every serious chocolate lover!